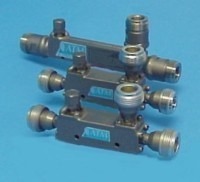 ATM manufactures High Power, Broadband Sampling, Coaxial Single and Dual Directional Couplers. Our RF coax couplers offer both octave band and multi-band for high power applications from 200W to 1400 watts. 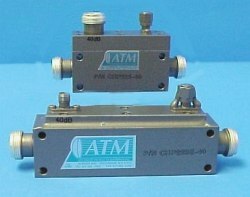 ATM's also manufactures a full line of Standard Coaxial Directional Couplers, 3dB Hybrid Couplers, and 90 degree Hybrid Couplers. For more information on our full line of high power directional couplers feel free to call us and discuss your needs with one of our design engineers. 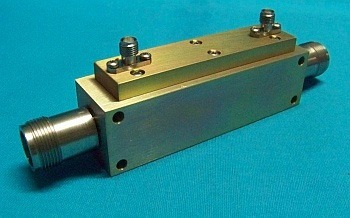 * 200 watt dual directional coupler readily available (specs the same as directional coupler). RF Power: 600W Average, 10kW peak, 900W avg. 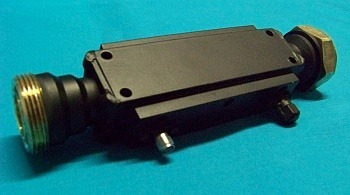 available with SC Connectors - Contact factory for details. Ex: CHP273L-30F-30R = CHP273L-30F-40R In this example a 30dB forward port remains the same, while a 30dB reflected port was changed to a 40dB reflected port. RF Power: 900W avg. 10kW peak. Ex: CHPsc73L-30F-30R = CHPsc73L-30F-40R In this example a 30dB forward port remains the same, while a 30dB reflected port was changed to a 40dB reflected port. RF Power: 900 Watts or 1400 Watts Avg. 10kW peak. min) Ins. Loss (dB)* VSWR max. RF Power: 900 Watt or 1400 Watt Avg., 10kW peak. Ex: CHP(7/16)73L-30F-30R = CHP(7/16)73L-30F-40R In this example a 30dB forward port remains the same, while a 30dB reflected port was changed to a 40dB reflected port.